The Lost Dungeons of Xon is truly a strange piece. When fully finished, it will be a set of connected adventures meant to guide your PCs on a series of missions that unfold as one large campaign once you are done. Sure, lots of modules do this, but Burning Yeti has taken things a bit farther by providing rules for The Lost Dungeons of Xon in three different formats: D&D 5e, Pathfinder and AD&D 1e. Okay, this isn’t all that unique either, as many indie companies try to make their adventures accessible to a multitude of rules formats. 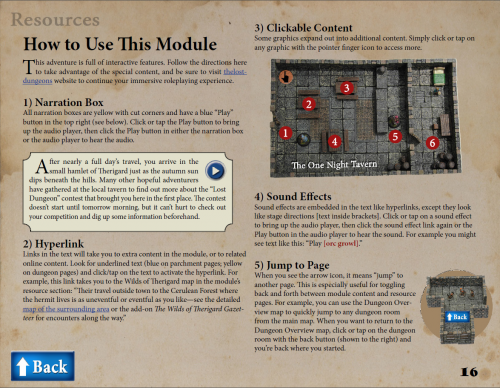 However, how many of those make those adventures into a full-on multimedia experience, complete with online visual and audio effects and guides for making the adventures playable via two highly successful miniature products: Reaper’s Bones and Dwarven Forge tiles? Well, you’re reading about the only one right here. Of course, such a lofty goal is a hard one to obtain. That’s why the first time Burning Yeti tried to do a Kickstarter for their idea, it came up short, raising only half the money they were looking for. Undaunted, Burning Yeti went back to the drawing board, talking things over with internal staff and the original 194 backers, and relaunched their crowdfunding efforts seven months later in February of this year. This time around, things were rather successful. The Lost Dungeons of Xon raised $13,899 (still less than the original $15,000 Burning Yeti was looking for in the original Kickstarter) from over 800 backers. 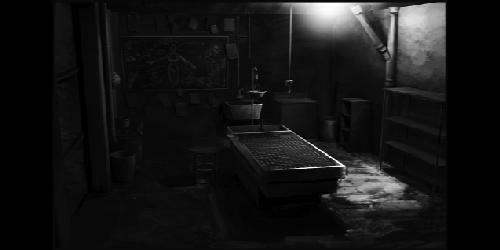 Now the fruits of their labor are starting to pay off, as pieces of The Lost Dungeons of Xon are coming in, and what’s here is interesting. The first thing you have to realize is that, while purchasing the adventures for The Lost Dungeons of Xon are quite inexpensive, getting the full-on experience as imagined by the team IS NOT. You’ll need to own at least two sets of the Dwarven Forge Dungeon Tiles for this adventure, and those are rather pricey. I have a lot of the Cavern Tiles and their expansions and man, those are expensive. As well, you’ll want to own the Vampire level pledge from the original Reaper Bones Kickstarter. Even when that Kickstarter occurred (a few years ago) that would put you back $100. Now, trying to get that pledge after the fact… well, expect to pay a lot more. Now again, you don’t NEED to buy all these pieces, and the adventure does offer printable maps of the tile setup, but to get the full effect as planned you either need to have a lot of disposable income or have taken part in the Kickstarters by Reaper and Dwarven Forge. To be honest, I DID back both companies, and that’s the main reason I backed The Lost Dungeons of Xon – it gave me something concrete to do with both miniatures sets. 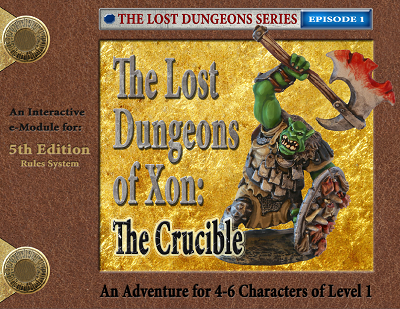 Besides The Crucible, backers of The Lost Dungeons of Xon currently have access to videos showing how to build the dungeons, sets of pregenerated characters for each version of the PDF (there is one for each system), and two prequel adventures (Choose Your Own Adventure style; there’s no mechanics or anything) that give newly made PCs a reason to be in town for The Crucible. More stuff is coming down the road, so your $5-$20 pledge will keep you busy for many months, as long as the content keeps coming regularly. Of course, there is no way currently for non-Kickstarter backers to buy in. There is some free sample content for people who sign up for an account with Burning Yeti, but there currently is no way for latecomers or people hearing about The Lost Dungeons of Xon for the first time via this review to buy in. Hopefully if this interests you, you can email Burning Yeti and they’ll let you into the fold. The actual first adventure for The Lost Dungeons of Xon, The Crucible, is nothing amazing or world-shattering. 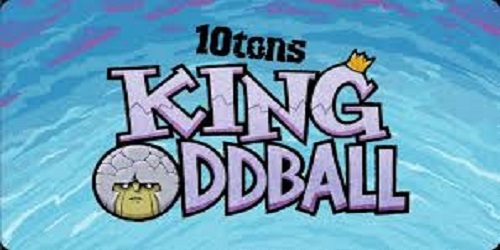 It’s a very simple adventure for 1st Level characters that relies more on puzzle solving than any combat. In fact, you can get through the entire adventure without actually killing anything if you play your cards right. So, while The Crucible is a fairly standard dungeon crawl, it is not a hack and slash affair. 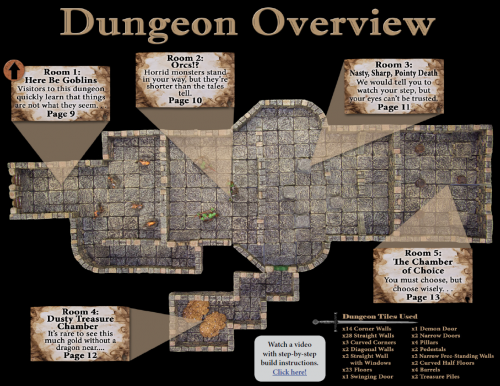 Playing The Lost Dungeons of Xon is probably more of a thrill for the DM than the PCs, simply because of all the bells and whistles that go into the experience. You have the audio and visual queues, along with the interactivity of the PDFs. PCs will enjoy hearing and seeing some of the pieces in The Crucible, but the experience is far more DM than PC-centered. The actual players will have a good time if they like minis and sound effects, but the story itself is pretty generic and mediocre. If this was a straightforward adventure, it wouldn’t be something you and your players would talk about weeks, or even days, after the experience. There’s nothing memorable about the writing or storytelling. When the plot is combined with everything else that goes into The Lost Dungeons of Xon, however, the pieces becomes very memorable, if only for the tech side of the affair. Each version of the PDF is 36 pages long. To use the PDF as intended, you need to be able to connect to the internet. You can still play the adventure without Wi-Fi or 4G access, but you won’t get a lot of the connectivity the adventure is designed for. It is also worth mentioning that I went and downloaded all six versions of the PDF (one of each version designed for the tablet and one of each version designed for PCs). Unfortunately, none of the links work on either the iOS or Kindle Fire Devices I put them on. That’s… not good, especially since the internet and interactivity are the prime selling feature of this piece. So this means you definitely want to test the PDF before you take it to wherever you plan on gaming. Otherwise, this is going to go over like a lead balloon. The effects all work on a PC though, and they do so superbly. Of course, each link in the PDF will open a browser window, so remember to close frequently. Otherwise you will have a lot of browser windows open on your device sucking up RAM. Each link has its own color scheme and design. A big blue circle with a Play symbol will start narration for the players to listen to. A bold blue link leads to somewhere else in the PDF. A regular blue link leads to a website. With Pathfinder‘s version of the PDF, it’ll take you to Paizo’s website, with descriptions of spells and what have you. Red links lead to sound effects like Orc and Goblin jibber-jabber or weapons clanging. It’s very cute and will bring a smile to your face, especially if you are the DM prepping the adventure and testing everything out. The story of The Crucible is light hearted fluff. There’s not a lot of substance, and the piece feels far more like a tech demo or intro piece for the system being run. Players are in a town where there is a contest being held for adventurers. Each team of characters has to try and find the location of a small hidden dungeon located somewhere near the town, make it through the challenges that await them inside and bring back the item that is keyed to their team’s riddle. The first team to bring their correct item back wins and gets 1,000 gold pieces as a reward. Like I said, this is not an epic story that will wow you or be an incredibly memorable bit of storytelling shaping how you play adventurers from here on out. It doesn’t need to be, though. Again, this is more or less a short and sweet, paint by numbers adventurer that focuses on puzzles and letting you try out the tech behind Burning Yeti’s ideas. The adventure is also meant to set up the eventual full campaign, which will no doubt consist of longer adventures with more in-depth storylines and larger dungeons. Remember to look at it as such, rather than trying to do a compare/contrast with something like The Tomb of Horrors. You can get through The Crucible in a single sitting. It’s a short but enjoyable adventure, and as I have mentioned many times in this review, the wow factor is more on the interactive PDF and way for you to use your Dwarven Forge Tiles with your Reaper Bones miniature in synergistic fashion. It’s also a nice way for Burning Yeti to show off their vision and build hype for their later adventures. I really enjoyed the piece for what it was. The PDFs are virtually the same, except for the mechanics behind each system, so it’s not like one will contain more content than the other. I think the 5e and 1e versions are better simply because both games have more of an emphasis on role-playing over roll-playing. Pathfinder tends to be the opposite, with a lot of hack and slashing and d20 rolling over acting out the situation or actually solving the puzzles, so I think there can be a real disconnect with the PF audience and this particular nigh-combatless adventure. Still, with the right group of Pathfinder fans, you can certainly make this work. Definitely go the D&D or AD&D route, though, if you can. Overall, this adventure is a cute start, and makes me hopeful of Burning Yeti’s other eventual releases. There are some bugs to work out with the PDFs on non PC devices, and the story for The Crucible is a bit thin/weak, but I loved the overall concept and enjoyed my time with the first outing for The Lost Dungeons of Xon, and that’s what matters. Definitely consider giving it a try, especially if you already have some Dwarven Forge tiles and miniatures to play the adventure with. Diehard GameFAN Presents: T-Shirts. Again.